Beautiful, complex and discussed here. The marine fish and reef section. I need help cos i never do somethink like that before. How to move puffer from 60 liters to 180 liters? What we have: i cant keep 2 tanks at once. Need one to replace the other and how to do it without harming puffer? Do I need to use old soil? Or a new one? Is it possible to add water from the old tank to the new one? 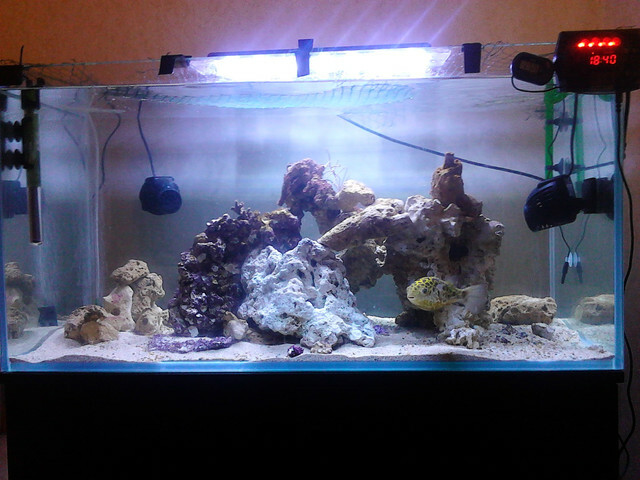 Just move all stuff from old 60l tank to new 180l and add some new sand/dry/live rocks/salwater? It's always best to move as much from the old tank over to the new one, since that's where all your nitrifying bacteria lives. LOL, crabs are pufferfood, NOT friends! What species is your puffer? I have 1 GSP. I saw some u tube videos where gsp swim around and dont touch hermits and decide to try it out. Throw my gsp in new 182l tank. A question is what i need to add\remove? and my hermit crab leave his shell and hide somewhere. cant find him -_- 4th day now. Probably i see him in live rock cave but not sure. what he doing? when and what corals i can add? i newb in this hobby sorry. Puffy about 1.5 year old/ 11-12cm. Get rid of the Eheim & add a protein skimmer. No need for a bubbler, the powerheads should move the water around enough & it's going to spray salt everywhere. Hermit is probably in your puffer's stomach. What SG are you at? SG 0.024-25 Full marine right? Cant add skimmer right now 8( need to w8t about 2-3 weeks. Did i need keep eheim till skimmer arrive? You mean, 1.025? No, you really don't need the Eheim--it's a nitrate factory for SW tanks. Where did the live rock come from? How many pounds/KG? And another question, i rly need to cover tank with web or somethink to prevent puffer jump or he cent jump high enought? Puffers are quite adept jumpers. +1 I found my GSP on the floor one morning after changing up my hang on equipment. I didn't trim a new piece of plastic for the back of the lid and he managed to jump out of a 2"X5" hole. Luckily he was still alive. I rinsed him off and burped him once back in the water. So, yes definitely want to keep the tank jump proof.